Here in the South, first looks aren't as frequent as they are elsewhere. I guess it's kind of tradition that the first time you see her, she is walking down the aisle towards you. This couple chose to do a first look - with their entire bridal party looking on. Lining the sides of the porch, the bride walked down deck from behind her husband, around him and stood in front of him before gently whispering in his ear. Now, normally, I see big smiles, step backs to take in the whole scene, WOWs and gasps. This one went slightly different. After opening his eyes and taking in the beauty of his wife-to-be, his reaction was tears. In fact, sobbing with a really wide grin would be putting it nicely. One of things I like to do right after a first look is to give the couple a few seconds to talk, compose themselves and enjoy the moment. I did the same here. Despite the truly touching moment, I don't want to interfere in some of the emotion of the wedding day. In this case, I felt it was appropriate to stop shooting and let them have some time. Weddings are emotional events on so many levels. Brides cry. Grooms cry. Parents cry. Guests cry. And while my job allows me to photograph all these emotions, I do believe the there are times when it is best to allow some personal time. 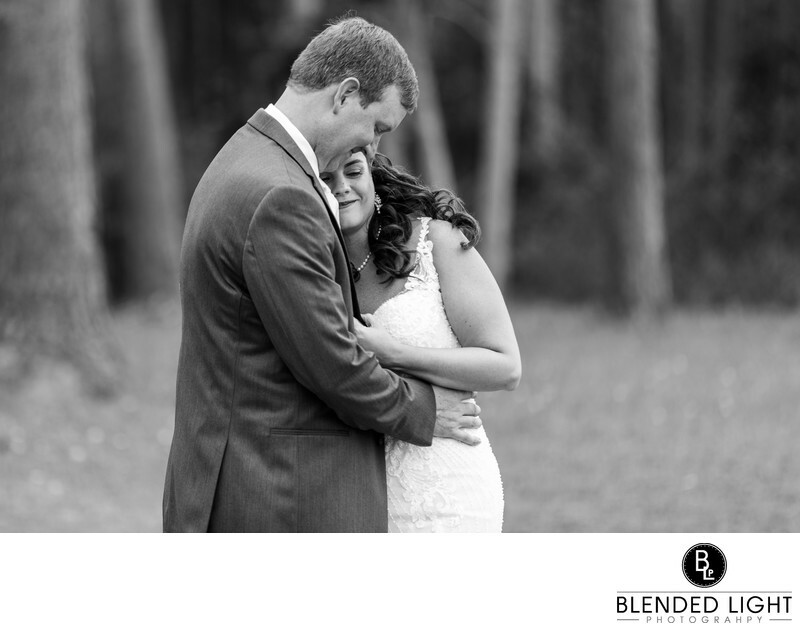 Location: Neuse Breeze Wedding Venue, 2391 Temples Point Road, Havelock, NC. 1/400; f/2.8; ISO 200; 180.0 mm.